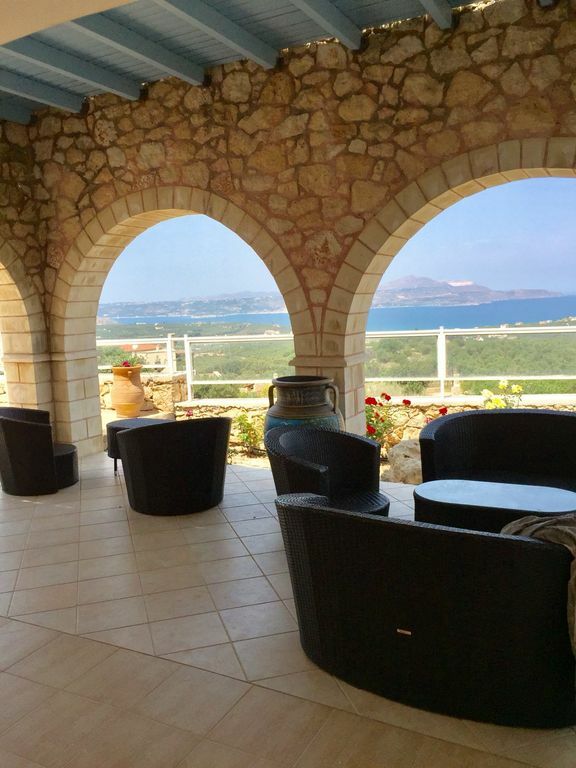 A magnificent villa, near Chania and traditional Creten fishing village of Almyrida. The Almyrida village centre is easily accessed by a short 5 minute drive where to find blue flag child friendly beach, many restraunt, internet cafes and a wide selections of village facilities. Located 20 minutes from Chania, 30 minutes from Rethymon, providing the perfect base from which to explore the other areas of the island. The large heated private swimming pool features wide Roman steps for easy gentle access with a Jacuzzi seating area. The villa also offers a fantastic rock garden with seating areas, ideal for those seeking solitary moments in a most wonderful setting. Unlimited WiFi access is available with additional charge of €5 per day. Please Contact the owner for this service. Beautifully furnished open plan living/dining room with open log fire, large leather corner sofa, dining table, chairs, coffee table ,DVD player and satellite TV. Modern open plan kitchen with coran worktop, extractor fan, hob, oven, fridge/freezer, dishwasher and microwave. Kettle, toaster, coffee machine. Full range of cooking utensils, crockery and cutlery. The nearest golf course is located in Hersonissos approx 2 hours drive from the villa. Notes on accommodation: The villa with central heating and air conditioning to all rooms. There are terraces and gardens. The grounds are tidy, clean and well maintained. Outside: The large pool side shaded and tiled terrace offers outdoor al fresco eating. The comfortable double lounger with mattress is perfect for dozing in the afternoon. There is a private pool side BBQ kitchen with sink cupboards and serving worktop. Sunbeds and prasols are provided. The 65 sq.m. heated swimming pool with Roman steps and Jacuzzi is totally private. There also is a poolside shower. Utility Room: Washing machine, ironing board, iron, clothes airer and hair dryers are provided. Cleaning / Towels / Linen / Maid service: Towels and linen are included, excluding beach towels.The villa receives a full clean prior to the guests arrival.If guests require maid sevice or further linen and towel change or pool heating during their stay this can be arranged at an additional cost. 4 dads and 8 children enjoyed this villa! Beautiful swimming pool and a fantastic view were the main bonus of the villa. Damn only the ants who lived with us in the villa:-( we still give 5 stars. I was a bit apprehensive about booking after reading the review from Rebecca, but we were really pleasantly surprised when we arrived. No problems to speak of and the staff working for the villa came to check on us on the second day to make sure we had everything we needed. The villa was luxurious with a homely feeling, while the outside pool area and veranda are such a relaxing place to spend evenings, overlooking the stunning bay. Most evenings we spent with the family taking in the views and having BBQs by the pool. The surrounding areas are also very quiet and we felt very safe, and the location is outstanding. We all enjoyed it so much, look out for us next year! I'll start with the good points! The views are exceptional! This property has the most beautiful views and every terrace makes the most of them. A beautiful spot to relax and drink in the scenery. The property itself could be gorgeous. It's very spacious and plenty of space for two sharing families with children. Now the bad...! the plumbing throughout the entire property is completely shoddy & needs a major overhaul! Within 24 hours of arriving we had a leaking bath, a leaking shower and the pool heating (which we had paid a lot of extra money for) had broken. 'Jimmy' the maintenance man was great and came straight away... but sadly fixed nothing! After a specialist plumber was called and a lot of black soot exploded (literally) all over the pool and terraces, the boiler was fixed and pool heating resumed! Then the downstairs toilet began to leak sewage water... stinking out the downstairs bedroom and making that bathroom completely unusable. This was never fixed either, even though Jimmy did come twice to look at it. The upstairs toilets then began to really smell too... badly... and we needed fans on all the time to keep the air circulating as the smell was so unbearable. By the end of the first week, the kitchen sink had also given up on us and was needing daily plunging! It began to leak every time we took the plug out and spread old dirty washing up water/food all over the terrace by the pool. So we were all treading in unpleasant old waste water which was pretty disgusting! the dishwasher also leaked permanently so we had towels all over the floor to soak that up! All in all - a disaster! We contacted the owner immediately and continued to contact her as we became more and more desperate. I can only imagine the house had been empty for a long time before our visit as the plumbing simply couldn't handle being used. At no point have we been offered an apology. We have been told that there will be no refund as she has spent a lot of money on the maintenance guy (the one who didn't manage to fix anything) and also on the pool heating. So it is up to us to bear the brunt of the costs. A huge shame and a very nearly ruined precious 2 week holiday. Had we realised how bad things were going to get we would have looked to move but with no wifi and the promise of things being fixed we tried instead to just enjoy our holiday. I would caution anyone looking at this villa - there are plenty of other options in the area! Dear Rebecca, thank you for your feedback. I always want my guests to have a good stay in my villa so I'm very sorry to have read your feedback. Im glad that the pool heating was fixed without delay. I'm also very sorry about the leaking to the bath and the toilet. I could not do anything about it because the maintenance guy Jimmy has visited you a few times about it and he could not find any problem. I did also enquired with the guest who left not long before your stay, they were not aware any of the problems. I now have asked the current guests, they finds no problem either. So I did not know how to resolve it for you. I have ordered a brand new dishwasher immediately after you informed me about the leak and Jimmy confirmed that the small leak is due to the wear tear of the dishwasher door seal. Unfortunately the delivery of the dishwasher was not speedy enough for your stay. The kitchen sink have been unblocked after many hours of trying and discovered many rubbishes in it that should be in the waste bin instead of the kitchen drain. Once again I'm saddened that you did not have a very good stay in my villa. I will continue to work hard and improve the villa because I know holidays are something special to look forward to. The view immediately hit us when we arrived at the villa. The villa is spotless and equipped with everything we need to a high standard, and was very easy to find, while not far from shops and beach. Almyrida and Kalyvas has everything we need for a fantastic holiday. But even so we ended up not going out much towards the end of our stay because it's such a nice place to relax. We most certainly will be back to enjoy this villa again - and highly recommend it to all our friends and family. Thank you Wendy for giving us the opportunity to stay in this wonderful villa, see you in the near future! Dejlig udsigt og velindrettet hus, der dog har en meget rungende akustik, som evt kunne afhjælpes lidt med gardiner af stof eller mere træ end glasburet. Vi manglede indendørsstole og bordplads til alle, når vejret var til indendørs spidning (efterår) vand og el ikke logisk fungerende, opvask kan ikke køre når nøglekort tages med på tur. Oplysning om varmtvandsforsyningen ville have været god at vide på forhånd,så det havde været super fra start. The beaches of Almyrida is 5 mins drive away, It's very gently sloping calm water is ideal for children. It also offers excellent range of water sports, Numerous tavernas, internet cafes, bars, mini markets, shops,chemist, bakery, banks, ect. 15 minutes drive to beaches in Georgioupolis which provides tavernas, watersports and gentle shelving sand for safer bathing. Car use is essential. Bike hire is available at Almyrida. Chania airport is a 40 minutes drive to the villa. Heraklion airport is 90 mins drive and has a larger selection of airlines. The drive from Heraklion is made easier by the National Highway. Detailed driving instructions are available from both airports to the villas. 5 mins drive to village centre of Almyrida. 10 mins drive to the village centre of Vamos. 20 mins drive to Georgioupoli. 20 mins drive to centre of Chania. 30 mins drive to centre of Rethymnon. 5 mins drive into beachfront and village of Almyrida, which offers chemist, ATM, bakery, veg shops (which also sell the local red and white village wines! ), banks, post office, numerous tavernas and cafes, mini-markets and two small beaches. 10 min drive to the town of Vamos which has health centre, tavernas and ATM. 20 min drive to Chania - a bustling Venetian harbour, where you will find Scuba diving, boat trips, water slide park, Saturday morning market, banks and much, much more. Chania, once the capital of ancient Crete, offers quaint, narrow streets as well as a beautiful harbour lined with tavernas and cafes serving excellent local cuisine. Further afield, a water park at Limnoupolis, the biggest karting track in Crete, opportunities for boat trips from the harbour at Chania and historical sights such as the World War 2 Allied and German cemeteries. For those who enjoy walking a visit to the Samaria Gorge is recommended, which meanders for 18km down a tortuous trail to the pretty resort of Agia Roumeli. Also the natural freshwater lake of Kournas provides a picturesque venue for lunch or a swim. Booking Notes: To make a booking, you can either call or email me. 25% non refunable deposit is payable at time of booking with balance payable 8 weeks prior to arrival. If booking made within 8 weeks, the full amount is to be paid at time of booking. Payment can be made by bank transfer in Euros or Sterling. Changeover Day: No preference.